I loved the Jungle Book growing up. I still do, actually. Several classic songs, the incredible voice characterizations, the great story. There is lots to like here. Probably my favorite scene in the whole movie is when Colonel Hathi is inspecting the troops. Mowgli, having met up with Hathi’s son, is at the end of the line. “Ahh… A new recruit, eh?” And, my favorite line, “I don’t know what the Army is coming to these days. These young whipper-snappers, who do they think they are?” J. Pat O’Malley’s voicing here is just brilliant. Interestingly, O’Malley also voiced the Colonel in 101 Dalmatians…basically the same character as Hathi, but a dog, and fantastic all the same! 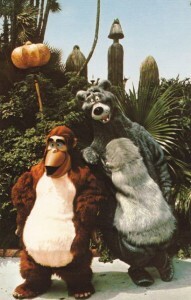 This card has Baloo and King Louie joking around at Walt Disney World. 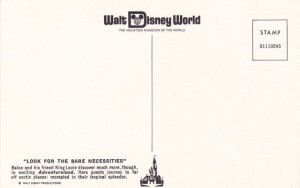 The card is WDW-0072 (01110245). 1000 records! Not bad! Sure, there is still a long way to go, but we are making some real progress. Pictures are slowly being added as well. I am still searching for people who are experts in Disneyland Tokyo and Disneyland Paris postcards and who have a checklist of what has been publish. If you know anyone…please let me know. I personally have under 50 cards from each park…if you have a list you are willing to share, we could “crowd source” the checklists! This entry was posted in Disney, Disney Postcard Checklist, Disney Postcards, Disney World, Disney World Postcards and tagged Adventureland, Baloo, King Louie, Walt Disney World. Bookmark the permalink.